You simply have to look up when you are inside the garage and you will see the shaft with the torsion spring on it, above your door. This moving component actually enables the door to stay in place and to move up and down. Without it, the unit will be stuck in place and have a risk of collapsing. Here you will find the most important things about this type of spring which most residential overhead doors have. When it comes to new garage door installation, the unit will come with its own hardware including the spring. This component is mounted over the shaft, which is affixed to the wall above the door. There is a drum at each end of the shaft. There is a lift cable going over each drum. The cable is attached to the bottom of the door. The spring's job is to counterbalance the door. For this to happen, it must hold force that's equal to the door's weight. During installation, it gets loaded with the required amount of force through winding. One important thing to keep in mind is that not any component can hold any amount of force. The spring’s length, diameter and wire size should always be selected based on how heavy the door is. Simply put, a bigger door will need a bigger and tougher component. It’s not difficult to understand how the spring mechanism works. During opening, the spring unwinds and the force is released and applied to the drums and then to the cables. This is how it is used for lifting the unit. During closing, the spring winds to get loaded with the same amount of force as before. But what if this amount is smaller or greater than it should be? In this case spring adjustment is required. It is easy to notice when the force is too little as the door is hard to open. When it is too much, you will have to keep the door locked to ensure that it stays close. The adjustment involves increasing and reducing the force respectively. Generally, it pays off to test the spring to see if it balances the door properly as part of maintenance. Once the opener is disconnected, the door is lifted manually until it’s halfway open and then released. If it moves quickly up or down, the tension requires adjustment. Let us, at Garage Door Repair in Stamford, do the work for you. 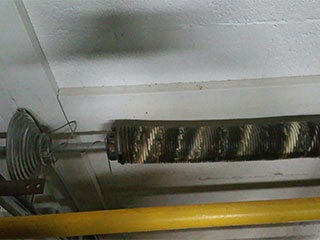 Broken spring is one of the most serious problems you can have with your overhead door. Leave the door as it is until the component is replaced. The ideal new spring should be strong, durable and long-lasting. It should have a cycle life of 15,000 or 20,000 cycles. Proper lubrication maintenance will also help for smooth operation and for reducing the natural rate of wearing. Lithium lubricant is great because it won’t get hard in the winter and cause trouble. All coils should be covered with the compound for best results. To sum it all up – make sure the spring is maintained seasonally and solve problems as they occur and not a day later.